The Unremembered, the first book of Peter Orullian's Vault of Heaven saga, was a largely generic epic fantasy that hit on a lot the major tropes. That made for a comfortably familiar read, but what made it memorable was his writing style, the strength of his characters, and the amount of detail invested in his world-building. It wasn't necessarily a ground-breaking work, but it was a welcome new flavor of fantasy that was darker, deeper, and more mature. I went into Trial of Intentions hoping for nothing more than an advancement/enhancement of everything that I enjoyed in the first book. I wasn't looking for anything dramatically different, and was actually worried that he might try to drag the story in a new direction, either to satisfy his critics, or to assuage his own displeasure with the original edition of his first book. There had to be some serious temptation there for him, I'm sure, but I'm pleased to say he's remained true to his original vision. The one thing that did shift a bit with this volume was the structure of his writing - probably the only thing that I found to be a (minor) disappointment. 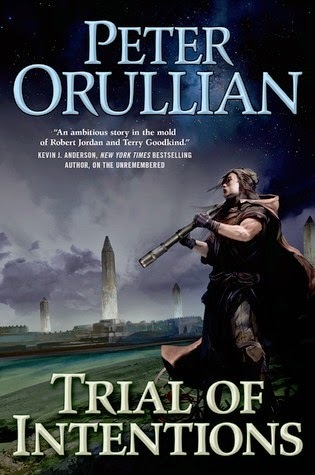 Orullian had said that his Author's Definitive Edition of The Unremembered was shorter and more focused, with fewer POV shifts, but he seems to have taken a step back here. Not only were there a lot more shifts than I remembered, but the chapters are much shorter. Yes, short chapters are a definite pet peeve for me, and that artificial driving of the story from one abbreviated POV to another was a challenge to me in terms of settling into a flow. I took me about twice as long to read this volume as the first, and much of that was my own difficulty with that flow. Outside of that, the story is once again well-written story, with even stronger dialogue than the first, and even more incredible visuals. 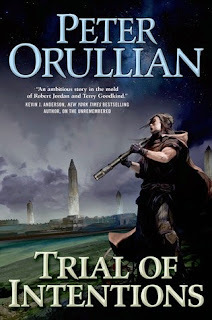 With Trial of Intentions designed to be a suitable starting point for new readers, a little info dumping and exposition is pretty much mandatory, but Orullian fits it well into the overall story. It's really nothing more than the subtle reminders you expect from the second or third book of any fantasy saga . . . there's just a little bit more of it. The characters came alive early in the first book, and they continue to thrive here, with even greater depth and diversity. Orullian forces us to question much of what we thought we knew about Tahn, Vendanj, Wendra, Mira, and even Grant. He 'broke' many of them with the climactic events of The Unremembered, and they're not allowed to just settle back into their old ways. They've been changed by their experiences, and they continue to evolve as they come to grips with those changes. Tahn makes a momentous decision early on, choosing not to speak the words as he aims, instead taking the decision to 'save' innocent children entirely upon himself. Wendra chooses as well, deciding to unleash the full fury of her song in a war against the Quiet, not caring that the Far are falling all around her as well. Even Mira makes something of a choice, deciding to embrace her betrayal, even as she seeks redemption for herself as queen. I thought I knew where a lot of these character journeys were headed, but Orullian can never be accused of taking the easy route. The world-building and the mythology are developed much farther and much deeper here as well. Of special interest for me was the deeper look beyond the Veil, and the deeper understanding of The Quiet. We've already fought the Bar'dyn, and already trembled before the magic of the Velle, but Orullian shows us that there are other people trapped beyond the Veil - including races that may be different, but which are far from monstrous. It's a clever undoing of the stranger/outcast fantasy trope, and it's a refreshing new angle that builds upon what's come before. In terms of mythology, he tosses some early surprises at the reader as well, first revealing some interesting ideas or theories regarding the Covenant Tongue, before driving us into a confrontation between the Sheason and the Velle - one that seems to destroy the legendary book. The world gets both wider and deeper here, and that's precisely what I look for in my ongoing epic fantasy reads. If you were one of those readers on the fence about The Unremembered, then nothing here is likely going to change my your mind. Having said that, I enjoyed Trial of Intentions, and I will be first in line for a copy of the third book when it's released. I have both of these books to review, although the page count is very daunting to me, considering my heavy review schedule. I hope to slot them in soon, seeing as how you enjoyed both! I'm going to have to get cracking on these books! I'm already considering the audiobook of The Unremembered so I can get to it sooner.